The Aztecs first grew tomatillos as far back as 800 B.C. and they have been popular in Mexico and other Latin American countries for many years. In the US, they are mainly grown in Texas. The condition of the husk is often a good indicator when selecting tomatillos. If the husk is dry or shriveled then the fruit is probably not in good condition. Select tomatillos that have an intact, tight-fitting, light brown husk. If you peel back a small part of the husk, the fruit should be firm and free of blemishes. Canned tomatillos are available at specialty markets and are often used when making sauces. Tomatillos are available year round in supermarkets and specialty markets. Domestically grown tomatillos are available from May through November. Fresh tomatillos with the husk still intact may be stored in the refrigerator for up to two weeks. They are best stored in a paper bag. Tomatillos last a week longer in the refrigerator if the husks are removed and the fruit is placed in sealed plastic bags. Tomatillos may also be frozen after removing the husks. The husks must be removed before preparing, but tomatillos in the husk are often used as decoration. Wash the fruit with soap and water to remove the film left by the husk. 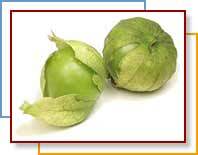 Tomatillos may be used raw in salsas or salads or cooked for sauces. Cooking enhances the flavor and softens its skin, but the result is a soupy consistency since the fruit collapses after a few minutes.